So I’m kind of obsessed with blueberries. I grew up with six blueberry bushes in my backyard, and I could never get enough. We had three varieties of blueberries trees. Each variety fruited around 2-3 weeks apart, giving my family and I unlimited snacking options throughout the summer. Even my dog enjoyed jumping up and snacking on them! Blueberries are packed with the beneficial phytonutrient ‘anthocyanin’, which gives them their beautiful royal blue color. They are also brimming with powerful nutrients such as vitamin K, manganese and fiber. These tiny fruits are cardio-protective (1), help fight cancer (2), and are even shown to help improve memory (3) in older adults. Who wouldn’t want to eat something that helped protect them from the leading causes of death in the developed world? Blueberries are versatile and pair quite well with many other foods. During the summer I love dining on fresh blueberries. However, the winter does not stop my (healthy) addiction. When they are out of season, I opt for frozen organic blueberries – usually from Trader Joe’s. They are affordable and last for months in the freezer. Frozen blueberries, and fruit in general, keep their nutrient quality very well when frozen! More info on that here. 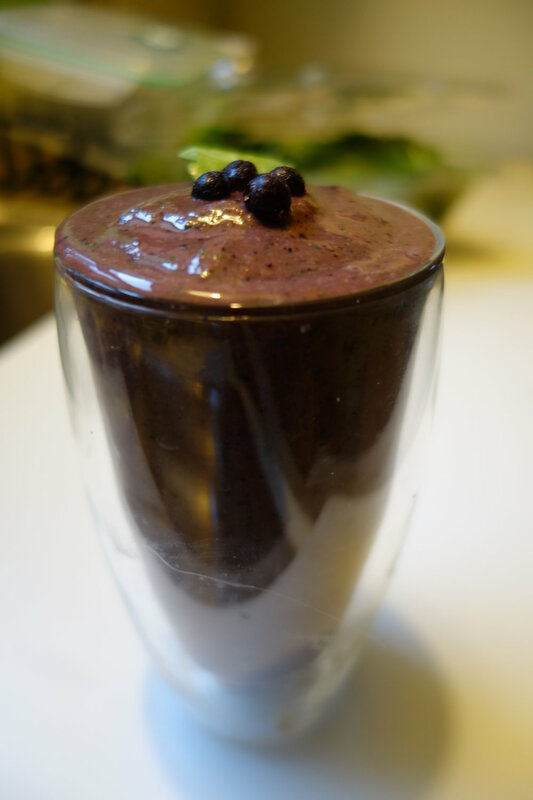 Here are my top 5 ways to incorporate fresh or frozen blueberries into my weekly routine. Blueberry overnight oats – Quick, nutritious, and delicious. Can’t beat the simplicity of overnight oats – especially if you’re like me and hit the snooze button until the very last possible moment. Blueberry Lime Salsa – This one is a bit unique, but definitely a crowd pleaser. It tops well on light, flakey fish, or simply paired with a spicy tortilla chip. Blueberry Basil Vodka Tonic – Obviously my list wouldn’t be complete without a cocktail recipe, and this one is a hit. Reminds me of summer, even in the winter. Blueberry + Peanut Butter Smoothie – Okay so this one tastes like a PB&J in a good way. It’s like a liquid version of our favorite childhood classic sandwich. I add protein powder to mine for a meal replacement. Blueberry Oat Muffins (GF) – These are delicious and actually pretty unhealthy for muffins – check em’ out! Comment below and share your favorite ways to add more blueberries to your diet! *Note all photos on page are taken and owned by me. Please ask if you’d like to use them! Kalt, W., Joseph, J. A., & Shukitt-Hale, B. (2007). Blueberries And Human Health: A Review Of Current Research. Journal-American Pomological Society, 61(3), 151. A Johnson, S., & H Arjmandi, B. (2013). Evidence for anti-cancer properties of blueberries: a mini-review. Anti-Cancer Agents in Medicinal Chemistry (Formerly Current Medicinal Chemistry-Anti-Cancer Agents), 13(8), 1142-1148. Krikorian, R., Shidler, M. D., Nash, T. A., Kalt, W., Vinqvist-Tymchuk, M. R., Shukitt-Hale, B., & Joseph, J. A. (2010). Blueberry Supplementation Improves Memory In Older Adults. Journal Of Agricultural And Food Chemistry, 58(7), 3996-4000.